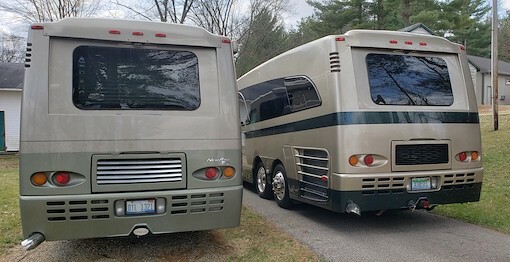 A fellow NewAire owner sent me these pictures of his 2001 NewAire parked side by side with another 2001 rig. The pictures were taken very recently in southwest Michigan. Have you guessed which one is for sale? It's the lighter trimmed rig pictured below. 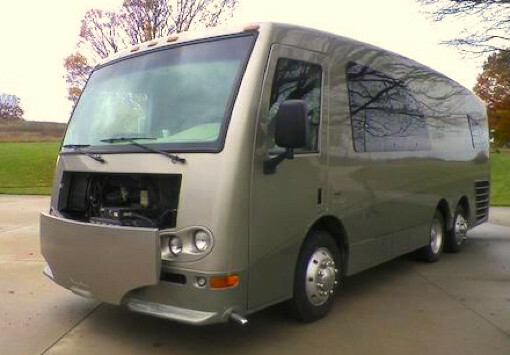 Fun fact: this coach is the very first NewAire production unit to roll off the assembly line. That's right - serial number one, numero uno. If you're interested in purchasing this 2001 NewAire, you can contact the owner, a nice lady named Jackie Luttmann, by phone (text or call 269-625-0578); or you can email Jackie by clicking here. 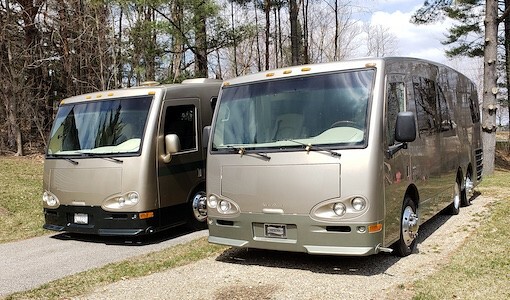 Click here to see the original 2001 and 2002 Newmar NewAire brochures and other interesting original NewAire documents. Click here to learn more about our original 2001 NewAire.